My friends over at Natural Herbal Living Magazine have put out an excellent monthly herb and ezine for the last few months. I have enjoyed reading each issue, and have learned about dandelions, roses, nettles and more!Their herb boxes are full of great products salts, flower essences, essential oils, tea blends, and handmade soaps that will help you learn about that month’s herb and how easy it is to use herbs in everyday life. Natural Herbal Living Magazine is an e-zine that focuses on learning to work with one herb a month. Our readers want a print version. Almost a year ago to the day we ran our first Kickstarter program to launch our herbal e-magazine, Natural Herbal Living Magazine and Herb Box. Although plans changed a little bit, from being a bi-weekly e-zine to a once a month super ‘zine, we have really embraced what we do and have been growing every month. Natural Herbal Living Magazine is an educational monthly e-magazine that focuses on educating our readers on a deep and profound level with one herb a month. The issues average 60 pages and are loaded with specialized herbal information. You may think that so much information about one herb would get a little boring, but our team of authors and experienced herbalists keep the issues enthralling with recipes for teas, salves, DIY decoctions, and so much more. They really delve deep into the uses of each and every herb we cover with both love and respect for the herb of the month. Over the last 10 months, people have requested print issues of the magazine and we are here to make that magic happen. Currently, issues are e-mailed to our subscribers on the first of every month as a PDF file, but some people learn better when they can hold a book in their hands, make notes, and have a print version to work with. After looking at several options, we have found a way to print each issue as a printed book. These books will be soft covered with a glossy finish, include photographs as seen in our most current issues, and will feature a notes section so readers can keep their notes on each herb in their book. It is like a personal yet extensive materia medica for each and every issue. These printers also offer the ability for the magazine issues to be printed in a “drop ship” model, one at a time, and shipped directly from the printer to each and every person who orders. These will be available for as long as Natural Herbal Living is around. We also plan to print our first year’s issues as a complete omnibus, from our very first free issue “Approaching An Herbal Practice for Beginners” all the way through this August’s issue, which is all about Basil. Our complete list of issues for our first year are Rosemary, Ginger, Rose, Echinacea, Elder, Hawthorn, Nettle, Dandelion, Plantain, Chamomile, Calendula and Basil.These first 13 issues will highlight our first year of work and will include a notes page, a nice index across all issues, and will be a hard bound book printed in full color. This will be a limited print edition, and the only way you can get a copy is through this Kickstarter campaign. But we need your help to make this magic happen. In order to make our magazine more visually appealing to our readers and make the directions easier to understand, our most recent issues have featured higher quality and more frequent pictures. In our first issues our pictures weren’t as frequent or as high quality. You can help make this happen! By helping to fund this Kickstarter, you get to pre-order your print issues. This allows you to be the first to get your hands on this valuable, educational resource so that it can be at your fingertips any time you need it. So please, if you value the educational material they can provide, or if you would like to learn more about how to build a relationship with one herb a month on a deep and meaningful level, help us fund this Kickstarter and bring the knowledge to the people! After all, herbal medicine is the people’s medicine. There is so much value to be learned. Not only that, learning how to make different preparations with herbs will save you money in the long run by empowering you to make your own herbal remedies. Enter below to win the past 13 herbal issues in print and PDF files PLUS their herb boxes (Rosemary, Ginger, Rose, Echinacea, Elder, Hawthorne, Nettle, Dandelion, Plantain, Chamomile, Calendula, and Basil), a $600 value! I have just received my Chamomile herb box and I love it! Honestly guys, when I opened this herb box my whole living room smelled like wonderful chamomile flowers. It smells amazing! So far I have tried the nightime tea and it’s perfect for de-stressing and buckling down for bed. Tonight I plan on using the soap and salts. I have a feeling I’m in for a real treat! These herb boxes are tons of fun! If you want the chance to win ALL of the herb boxes so far, then enter below! The articles are very informative and useful. I would like to see more ideas for incorporating herbs into daily living outside the kitchen. I love learning about essential oils and herbs. Diy natural beauty is fun to read about too. thanks! 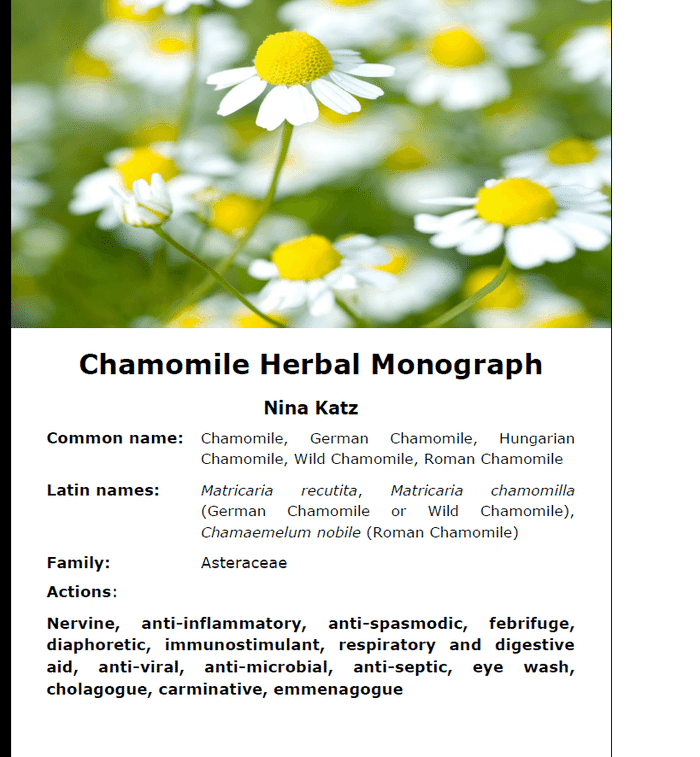 Love the herbal monographs on this site. Also the herbal recipes, and would like to see even more of these. The magazine and herbal boxes sound amazing. This is definitely on the top of my Christmas Wish List!